With more than 70 percent of healthcare organizations offering some form of telemedicine solution or service, we can now draw the line in the sand — telehealth has become a widely-accepted form of care delivery in the United States. As a result, we’re seeing some interesting follow-on trends, challenges and innovation developments that have broader implications to the healthcare industry. The U.S. Department of Veteran’s Affairs (VA) recently rolled out a suite of telehealth services to expand healthcare for our nation’s veterans, bringing much needed care to those who have struggled with access because of remote locations or limited mobility. The announcement made national headlines, helping to underscore the progression that telehealth has made in recent years—one that seemingly has reached the tipping point. Improved access—removing barriers to care for remote patients and those unable to travel to urban locations. Reduced costs—reducing readmissions and shortening hospital stays. Improved quality of care—as good as in-person consultation, a good example being telestroke apps to reduce critical time-to-treatment. An annual HIMSS survey taken in the spring of 2017 shows adoption of telehealth by both rural and urban health systems growing substantially over a three year period, from 54 percent in 2014 to 71 percent in 2017. 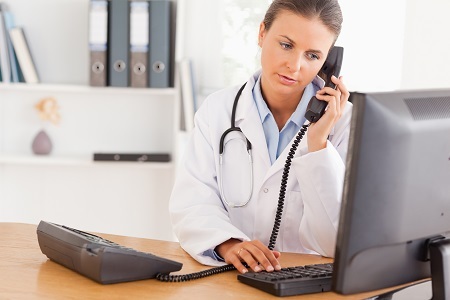 The study also identified that inpatient facilities have adopted telehealth modalities at almost three times the growth rate identified in 2016 and almost half of all private practices have adopted some form of telehealth. A major barrier for telehealth has been the lack of reimbursement for services, leaving providers with the difficult choice of carrying the added financial burden, passing it on to their patients or going without. The good news is that coverage seems to be expanding as most states have adopted some level of parity legislation requiring equal reimbursement for telehealth services as outlined in the Center for Connected Health Policy, National Telehealth Policy Resource Center report released in April 2017. The market has borne out these findings, showing significant investment being made in telehealth. A Zion Market Research study valued the telehealth market in 2016 at $18.2 billion globally and estimated that it will reach $38 billion by 2022. A related and interesting phenomenon taking shape that has broader implications across the entire healthcare landscape is the apparent consolidation of telehealth companies. Teladoc, who according to Reuters has captured about 75 percent of the telehealth market, has purchased Best Doctors, Stat Health Services and HealthiestYou. An upside to this level of consolidation is that it will likely result in a more unified IT platform—one that is easier to manage and integrate with electronic medical records (EMR). The FDA is doing its part to make sure it’s not impeding progress. In June 2017, it took two steps that will positively impact medical devices and telehealth modalities. First, it announced the aim to revamp certification processes to expedite approvals of "lower risk digital health products" and a "streamlined FDA premarket review" for products with a higher risk. Second, it launched an initiative to certify companies, rather than each product, based on that company's development, testing and maintenance processes for all products. In the same month, the FDA approved several telehealth devices for use, including a portable echocardiogram combined with a digital stethoscope, and an at-home phototherapy device for dermatology treatments. Such approvals signal the FDA's desire to be, as FDA Commissioner Gottlieb calls it, "forward leaning…to encourage safe and effective innovation." Telehealth requires the transfer of large volumes of patient data to/from remote locations while keeping it secure in transit. Data environments, especially in healthcare, may have previously lacked the security needed or have been unable to support remote data exchange of this magnitude. That is, until shared data environments such as data lakes have come into the picture, enabling providers to take advantage of telehealth services while keeping data private and HIPAA compliant. Data lakes provide a modern platform that can help deliver more personalized care with tools that: aggregate, manage, filter and analyze a much broader set of data points coming from across the care continuum including remote monitoring applications. Imagine the meaningful insights that could be uncovered when data flowing from FDA-approved home care devices to the EMR is captured—a level of connectivity that helps realize the vision of a 360-view patient record. We will be able to capture data regardless of entry point, whether it be patient data obtained during an in-office visit, from the patient’s bedside or at home. Patients as consumers want the convenience and freedom that telehealth offers. A recent Advisory Board survey identified that 77 percent of patients would consider seeing a provider virtually. There is a willingness to engage with apps and wearable devices, connect remotely with a clinician and share health data, especially amongst millennials. We see this with the increasing use of smartphone video calling apps to conduct virtual consults with a primary care physician. And chronic disease patients, like those suffering with chronic heart diseases are now relying on mobile technologies like the FDA-approved AliveCor app, used to monitor heart rhythms. Results can be easily sent to a physician via email. Forces are colliding — from the rapid expansion in the number of digital connected devices and CLIA-waived home tests coupled with health-related apps, to telehealth reimbursements, to the advent of patient consumerism. And data is at the heart of it all, where improvements in data storage, compute and analytics will continue to translate to a connected health ecosystem that knows no physical boundaries. Patient records will no longer be a patchwork of episodic data, but instead, consist of a constant flow of updated information that can originate anywhere, whether inside the hospital or at home, and that can be translated into real-time, clinically-actionable insights at the point of care. When that happens, the longitudinal patient record will be realized. And with it, we will see telehealth continue to reshape healthcare in new and transformative ways. Telehealth is indeed here to stay. The question is, how can we best leverage its capabilities?